Any Video Converter’s intuitive and easy-to-use interface has impressed so many users, easy file operation and output management makes video conversion simple as a breeze. You don’t have to know what video codec, audio codec, bitrate, sample rate or frame rate is, all you need to do is just 3 simple steps which are adding videos, choosing your device or format and clicking the convert button. So even a novice can master video conversion in only 3 minutes. 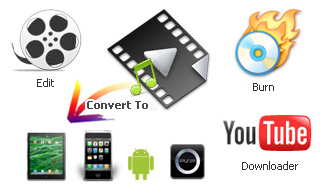 Any Video Converter provides a full-featured yet totally free version. The fact of that, the free version is much more powerful than many so-called professional video converters, has been approved by millions of users and professional editors from CNET, PCWORLD, Lifehacker and more. And the professional and ultimate version of Any Video Converter cost less money than other competitors. What’s more, it’s only a one-time purchase to buy the professional or ultimate version, there is no upgrade fees, no subscription fees or any other cost. Many video converters use open sources like FFMpeg.exe, Mplayer.exe and Mencoder.exe directly without any improvement. So some so-called professional video converters can’t even recognize AVCHD video files with extension M2TS or MTS which are common camera shots or video recordings taken by iPhone, iPad, Android phones or tablets and camcorders. Any Video Converter is still based on FFMpeg.exe, Mplayer.exe and Mencoder.exe, but AVC team has added many dynamic link library files to support more input video and audio formats. The conversion engine is a great improvement and can recognize much more video formats than other competitors. This is really helpful for those who want to convert industry-based video format to common video formats for promotion and business. When using AVC to convert a batch of video files, you don’t feel any lag of your computer because it’s not memory consuming. You can still open your browser to view news or videos, type words in your office software, or design your website or photos, etc. By monitoring the performance in task manager, we comes to the conclusion that Any Video Converter is pretty optimized for parallel tasks in the source code level. Of course, you can also speed up the conversion by enabling NVIDIA CUDA and higher simultaneous conversion tasks. However, AMD App is still not adopted for AMD users. We hope this feature could be added soon. Video conversion is not all what we concern. DVD ripping and YouTube download are also what we want to test. To our surprise, Any Video Converter does do a great job too. * Any-video-converter.com respects the rights of artists and film companies, and the proper use of the software does not violate those rights. You cannot copy DVDs in order to sell or give away copies, or for any commercial purpose. Now let us have a glance at YouTube downloading. Some other similar programs may ask you to install a plugin for YouTube downloading, and when you watch YouTube videos online, an annoying download button appears on the video. Some other programs only download FLV format whose quality is not good enough. Any Video Converter does a better job. It adopts a true-path detecting script to detect all available downloads for the pasted YouTube URL, then you can choose 3GP, FLV or MP4 in SD or HD dimensions depending on your need. Any Video Converter can also help you to burn videos to DVD movies for DVD players as well as AVCHD movies for Blu-ray players. Both NTSC and PAL TV systems are supported. Some other vendors also create a standalone DVD creator and sell at $29.95 or more without the ability to create AVCHD movies. But the fact is that it’s still not as qualified as Any Video Converter Free which can burn both DVD and AVCHD movies. The one thing we want AVC team to improve is to add ISO image output which is also widely used and needed. Another feature that most other video converters don’t include is video recording. As we know, many online videos can’t be downloaded because of the encrypted algorithm. The ultimate version of Any Video Converter offers the video recording solution to solve the problems. Any Video Converter Ultimate can smartly detect video playback area and mark the area in a red rectangle, then you can use hotkey or button to start recording. Video area of most online streaming video sites can be correctly detected. If not, you can also manually adjust the rectangle. Some video recorders can only record video on the screen without recording audio. When Microsoft released Windows Vista and later versions, sound recording has been disabled in hardware by mainboard manufactures for copyright reasons. However, by using a revolutionary virtual sound recording technology, Any Video Converter can also record sound along with the videos without any A/V sync problem. The recorded video will be saved as MP4 video. The video recording function can be also used to record iTunes M4V movies or TV shows. From what we describe above, you can understand why Any Video Converter have so many fans and supporters around the world. Just say, if you want your digital life to be more simple and wonderful, Any Video Converter could be one of the best choices.